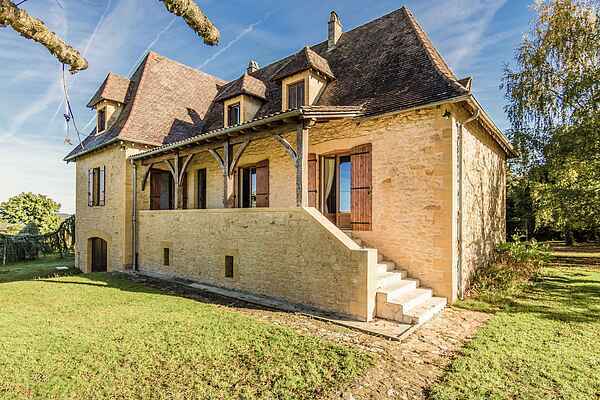 The architecture of this home near Marquay (1 km) is typical of the Périgord region. During the long, hot nights you will not want to leave your veranda. Here you will enjoy magnificent views of Marquay and its lit up medieval church. All around your holiday home you will find an immensely big garden with lawn, playing field and fruit trees. A true paradise. You can reach the house via the raised veranda. In the lounge you will find a classic open fireplace. Of course you will explore your surroundings. There is much fun to be had for both young and old. What about the prehistoric caves of Les Eyzies-de-Tayac-Sireuil (15 km) for instance. The 'Pearl of the Périgord', the beautiful town of Sarlat-la-Canéda (13 km) is well worth a visit. The old houses, cathedral, but also the lovely shops and terraces turn this town into something to be remembered. Would you rather cool down a bit? At the lake of Tamniès (8 km) you will find several water sports facilities. This region is home to many castles. The impressive Château de Fénelon (30 km) is highly recommended. The ancient towns of Belvès (37 km) and Gourdon (36 km) make this picture complete.